Today’s Ecuador deal of the day is in an area of the coast that has been completely overlooked by foreigners, yet I don’t understand why because its nice with huge deals to be had and just minutes from an airport with daily commercial flights to Quito. The area was also not effected by the recent quake. 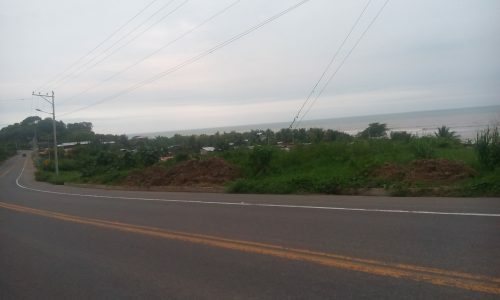 The lot is 250m2 beachfront to highway. The highway access is great. The lot also has water and electric hooked up and did I mention, its right-on-the-water beachfront with no road or boardwalk in front? The lot is located minutes from the town and airport in Esmeraldas headed to the north. To contact the owner of this lot please call 0991969909 (Spanish only), I can not answer any further questions about this lot because I have NOTHING to do with it, I just saw it advertised through my grapevine, and for beachfront, wow, what a deal. Posted on April 27, 2016 Author adminCategories Ecuador for Investors, Listings - Deals of the Week!